I was visiting East Africa, more precisely Kenya, for the very first time during the last week of September 2016. Living in a tent on the banks of the Mara river in the Mara Triangle, Maasai Mara, my aim this safari was to get proper wildebeest migration moments and to capture the intimate predatory interaction during this time of year in Kenya. I was prepared from a technical and equipment point of view, but was absolutely amazed at the beauty and giant open plains and majestic skies of this place, a true eye-opener! 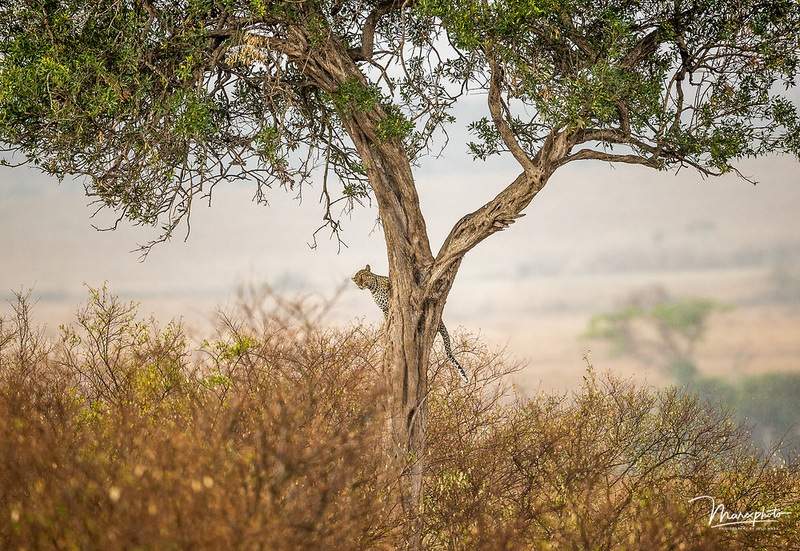 During our stay, we were fortunate to have one particular leopard sighting on a late afternoon. The rain was just wetting the dust and the light was beautiful. A spot on the horizon grabbed our attention. We came across a female leopard crossing the savannah on her way to where her cubs are. We knew this as the female was lactating. No one have seen her cubs yet. After resting a moment in the grassland, she headed towards a tree in a thicket and we lost her for a moment, when suddenly she ascended the tree and paused as she was half way up. This created a perfect opportunity in soft rain and perfect light. The green leaves on the upper part and the rich colours on the bottom part, framed the leopard as she was pausing is this position on her way up. She remained in a diagonal position for a few seconds as she scanned the environment. I made sure to focus on the leopard’s eyes and to have the tree and leopard both in focus. The rain drops were slightly visible on the left and right of the frame in this scene. I was very happy to get a portrait of this leopard in her environment in such a unique way. I now understand why people visit this magical place in Africa. A Selection of African land predators from countries including Kenya, Botswana, Namibia and South Africa.